While the trade has mostly disappeared in western nations, it continues to strive in sub-Saharan Africa where the use of tin buckets is widespread and very important to daily life. The use of tin buckets for cooking, bathing, and the transportation of water are an integral part of life, and the local tinsmith and his art of fabricating and repairing these utensils are critical to the village. Fredrick Mbaluku is a 58-year-old professional tinsmith. He is a father of five and comes from Mwankhuku Village, near the Ntchisi Trading Center. Despite having a skill that could earn him a good living, he was only selling his products at a shop outside his home in the village. The trading center where large numbers of people offered unimaginable potential, was out of reach because of his inability to walk. But he did not lose hope and was always determined to work and provide for his family. 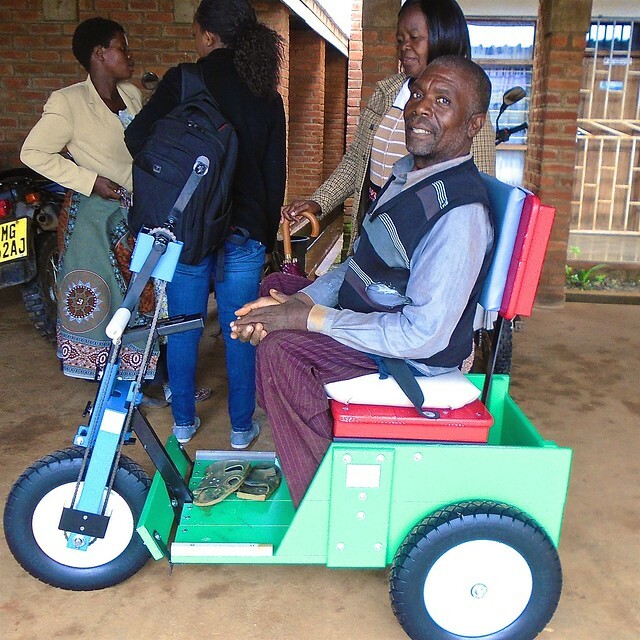 Fredrick is another example of someone who went from dependence to independence with the help of a mobility unit. His is just one of the 1,000 we’ve shipped to Malawi so far, we want to help all the people in Malawi create an independent future for themselves.